Shanghai issued permanent residency permits to 18 foreigners on Tuesday, part of steps China's commercial hub is taking to deepen its integration with the world economy. "This is a major step for China's reform and opening and economic development, synchronizing with international practice," Shanghai Police Chief Wu Zhiming said at a ceremony. One of the recipients, Portman Ritz Carlton Shanghai vice president Mark DeCocinis, said the permits were an important recognition of foreigners' contributions. "It's going to make me feel even more connected to the city," said DeCocinis, an American. The permits reflect Shanghai's relatively international outlook. The city's international heritage is evident in its architecture and lifestyles, and its 80,000 registered foreign residents play a prominent role in businesses from heavy industry to restaurants. The residency permits allow recipients to live and work in China for 10 years without a visa. Those who received them Tuesday came from the United States, Thailand, Britain, Germany, Canada, Singapore, and France. 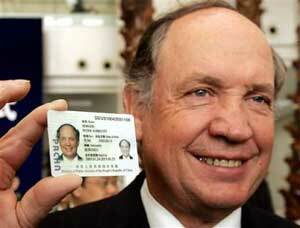 China began issuing permanent residency permits last year, with Shanghai handing out a total of 49 so far. "There has been a big jump in the numbers of foreigners in our city and they have made a major contribution to our technology and economic development," Wu said. The city is encouraging foreigners to apply, but moving slowly on issuing the permits. So far 7,000 inquiries have been received, but just 160 applications accepted, said Ma Zhendong, director general of the Shanghai Exit-Entry Administration Bureau. "Right now we're looking for people who have invested significantly in Shanghai, who are high-ranking leaders of their companies and who bring specific useful skills," Ma said.